Liberator of Venezuela, Colombia, Ecuador, Peru, Bolivia and Panama. Incomparable figure in American history, was privileged to possess the gifts of the man of action and of the thinker in the highest degree. He/She was born in Caracas on July 24, 1783 and died in Santa Marta on December 17, 1830. Simon Bolivar, the National Library of Paris engraving. The time of his birth, Caracas was a city of median wealth, which not exceeded 40,000 inhabitants. Their society was hierarchical, but due to its proximity to the Caribbean, very open to the world and outside influences. Bolivar lost his father at age three and his mother by nine. He/She was for some time in the care of his grandfather Feliciano Palacios and his maternal uncles, along with his two sisters and his brother Juan Vicente. Orphan, with a considerable wealth and heir to extensive plantations, did not have a happy childhood and a systematic education. Among his tutors included great men of letters, Simón Rodríguez and Andrés Bello. In 1799, the grandfather died, met the guys send it to Spain to study. It is his first outing abroad. In the Madrid de Carlos IV has the help of his uncles Stephen and Carlos Palacios and especially of the Marquis de Ustariz, in whose house was hosted for a time. He/She received the education of a young man of high class of the time, learning foreign languages, dance, math, riding and history. He/She then met María Teresa Rodríguez del Toro, marries her in Madrid and returns to Venezuela. January 22, 1803, just eight months after his marriage, death of his wife in Caracas. Despondent and desperate, Bolivar resolves to return to Europe in October 1803. It remains in Madrid shortly and may be found in Paris. It is a time of great innovations on the stage of ideas and politics. The consul Bonaparte is heading to become the Emperor Napoleon. The Napoleonic wars changed the political map. In this changed scenario the young Bolívar seeks its course, defining its decision to devote itself to fight for the independence of Spanish America. (See independence of America - in a voice independence). At the end of 1806 comes back from Europe heading to the United States, returning to Caracas in June to apparently engage in the management of their estates. From April 19, 1810 he/she began public life of Bolivar. The Caracas Junta which deposed the Spanish Captain General appoints him to preside over the mission that, together with Luis López Méndez and Andrés Bello as Secretary, moves to London to explain the situation and to seek support from the British Government. It is a difficult undertaking for the misleading official location of the Board, appearing ostensibly as a defender of the legitimate King Fernando VII against French encroachment and the cooperation of the English forces in the Spanish resistance. It is the first time that Venezuela acts on its own to a foreign power, making the understanding of the Cabinet in London and contacts with influential characters. Bolivar meets for the first time the predecessor Francisco de Miranda and incites him to return to Venezuela. (See Francisco de Miranda). For December is back in Caracas. Along with Miranda and other Patriots cooperates in activities of the patriotic society, which is the most active center of propaganda of ideas of independence and Republic. The 3 July 1811 there pronounce his first speech of relief. He/She joined as official forces which directs the general Miranda against the insurrection that has emerged in Valencia (July-August 1811) and begins a period of intense activity. Finally, after the fall of the first Republic of Venezuela and the capitulation of Miranda he/she manages to escape to Curaçao on August 27 and moved to Cartagena de Indias in October. He/She goes then to the Congress of New Granada offering their services, so associated with the fate of Venezuela from Colombia. In the letter addressed to you by poke first concepts will then become fundamental convictions of Bolívar: the need for a strong, centralized government, hostility to the ideologues in favour of inadequate institutions, awareness of the need for the close union between New Granada and Venezuela and the conception of independence as a continental project. At the service of the New Granada into action military in 1812. After acting in the lower Magdalena began in 1814 the so-called Admirable Campaign. In three months of operation deploys its military Chief conditions: decision speed, the speed of movements and the high-energy appear as his character traits. It is then when launches Guerra proclamation to death in Trujillo, which gives a national consciousness to the fight and definitely separates the Venezuelans of the Spaniards. In August he/she entered Caracas as a victorious general and head of the new political situation. It is now captain general of the armies of New Granada and Venezuela, and the municipality gives the title of Liberator in October 1813 and the employment of captain general. But non-institutional viability of the newly established regime is compounded by the emergence of the realistic caudillo José Tomás Boves on the Plains. The llaneros, in a war that is deeply adapted to their environment and character, they invade the center of the country, affect peoples and defeat the forces Patriots. Sometimes Bolívar achieved a victory that seems to change the situation, as in Araure, but consequences last little in that State's general dissolution. Finally, the freedom fighters leave Caracas and migrate towards the East. With the relics of the patriot army, which has reached to New Granada, Bolívar again takes command of the neogranadino Government. In 8 months of non-stop activity releases to Santa Fe de Bogota, down to the Magdalena and arrives to Cartagena, where he/she was denied support asking to go to liberate Venezuela. On 8 May 1815 embarks to Jamaica in search of aid to a new campaign. In Kingston, on 6 September, he/she published his letter of Jamaica, in which it describes the situation and augurs well for the future of the continent. Then goes to Haiti, where he/she meets many patriots who have fled. Get the support of the ruler of the South of Haiti, Alejandro Petión, to prepare a new campaign. With the experience accumulated in the long and unfortunate struggle, with a more complete picture of the social problem, which intensifies her with what has known of the past of Haiti and Pétion insistence on the need for Justice for blacks, he/she conceives an action of more popular and revolutionary content that can achieve the necessary popular support in the independence struggles. Finally, the so-called expedition of Los Cayos part towards the continent March 31, 1816. Reach Margarita on May 3 and is supported as a paramount chief, promising to convene a Congress to restore the State. December 18, 1816 embarks finally on the second expedition that part of Haiti, called "Expedition in Jacmel" for having left that port. Equal to that it had occurred in the previous one, in this final and definitive attempt to create a solid base of operations and a stable Government in Tierra Firme, Bolivar will face serious difficulties. The Spanish expeditionary army by general Pablo Morillo, arrived in May 1815, had dominated almost the entire Venezuelan and subject also to the New Granada by mid-1816. Faced with this situation Bolivar must resolve key issues previously and before the recognition of their Supreme Headquarters. Guiana decision ensures an impregnable base of operations with the interior and the Orinoco. Prepares plans of campaign, organizes the army, tries to operations on the Center and cares for giving depth and content to the revolution. He/She also began publishing the Correo del Orinoco in Angostura, which becomes the awareness doctrine and the best instrument of revolutionary propaganda. In February, 1819 the Congress of Angostura, aiming to lay the institutional foundations of the new State is installed. Immediately after constituted the State with its authorities, being elected President and to present a draft Constitution, Bolívar part for the Apure and quick and surprising starts the campaign which, through the Andes, will take you to suddenly confront troops who had left Morillo in the Viceroyalty and to defeat them decisively in Boyacá in August 1819. Loosed the Nueva Granada, becomes the basis for the realization of vast plans aimed at the independence of the southern territories; on December 17, 1819 at Angostura proclaims the Republic of Colombia and was elected President. With the immense prestige and resources that has given it the victory of Boyaca, moves unceasingly to organize politically and militarily the new situation, while convened a Conference in the Rosario de Cúcuta to the constitutional organization of the new State. In June 1821 obtains, in the Savannah of Carabobo, the victory that sealed the independence of Venezuela. But the difficulties have continued. Anarchic and regional trends are large and in the Congress of Cúcuta again appears the purpose of more liberal ideologues of creating a Federation weak and almost nominal. Although Congress elects Chair and Vice Chair general Francisco de Paula Santander, the structure of the new State presented serious obstacles to its operation. Venezuela, like other countries, was divided in departments not associated with the other, which depended directly on the capital in Bogotá. It was Vice-President Santander in the exercise of all the powers of Executive, next to the central bodies of the Government, while Bolivar, as campaign President, coated special for her, powers was heading south. Three different scenarios are configured as well. Venezuela, the rearguard, poorly built to the new administration and with visible resistance; New Granada, with the seat of the Government and many obstacles to centralize and regularize the Administration, and the South, in the Ecuador and later in Peru, with Bolívar to the head of the army in a distant and expensive campaign. The campaign of the South will take you to the central part of the coast Pacific and the Andes, in a very different geographical and social reality. Bolivar stumbles with the desperate and tenacious resistance of the realists of grass that covered its rough terrain opposed great resistance. The Peru already are Argentine, Chilean and Peruvian forces which commands the general José de San Martín. (See San Martín, José de). After reaching the freedom of Chile, they managed to invade the Peru coast and get to Lima. The viceroy, with the bulk of his forces, is retracted to the mountains, where it has resources of every kind to threaten the fragile independence proclaimed in Lima. 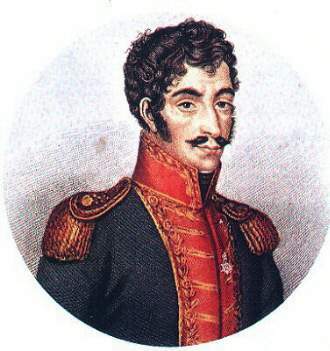 Bolívar returned to Lima and, aware of the seriousness of the situation, leaving Sucre as its representative and retires to Trujillo, in the North of the Peru. In the midst of anarchy, of the failure of some Warrior action and attempts of murky compromises to seek an arrangement with Spain, the situation arises in extreme terms. There seems to be another possibility of defeat Spanish forces that offered Bolívar. For the campaign that occurs does not count with the reinforcements of Bogotá. With the cooperation of Sucre and supported by the remains of Argentine, Chilean and Peruvian forces who have joined him, embarks on one of its most difficult and risky military companies. In their advance across the Andes defeat in the pampa of Junín August 6, 1824, the army of operations of the saw to send the Spanish general José de Canterac. It is the battle which, together with the de Ayacucho of July 1824, sella Peruvian independence. The victory is total and definitive. He/She has concluded with that win the long war of 14 years that Bolivar has led to independence from Spain, its American possessions. However, his political enemies achieved that in Santa Fe de Bogotá removed the extraordinary powers as President in campaign and to the command of the army. Bolívar conceived then is the formation of a new political unit exceeding trends regionalist through the Confederation of a group of American countries that understand to Mexico, Central America, Colombia, Peru, the Alto Peru, which will soon turn into Bolivia, and Chile, which may constitute a new concentration of power in the world and counterbalance the threat of the Holy Alliance in Europe and increased and new centers of power that are announced in the future in the United States and Brazil. To this end it calls from Lima December 7, 1824 the Congress of Panama, which will meet in 1826. Men who achieve local power in the shadow of the war feel the authority of Bolivar as a hindrance. The first and more alarming signs of cracking of the Gran Colombia appear in Venezuela the same year in which the Congress of Panama should mark the consolidation of unit ideals. Disgruntled with the Colombian union surround Páez, whose authority has grown so overwhelming in Venezuela, and take advantage of an incident emerged with the Bogota Government to bring the situation to a serious breaking point. In the Nueva Granada also has been formed a core of antibolivariana resistance in lathe Vice-President Santander. Although they are against the Constitution, at the same time they expect to Bolívar to crush the insubordination of Páez in Venezuela. Bolivar, who had been dreaming about the possibility of retiring after completed the military phase of independence, is tied more than ever to the obligation to govern. Return to Bogotá, where open signs of discord and division and returns to Venezuela, after years of absence. It will be the last visit to his homeland. With the enormous weight of its authority and in a delicate blend of firmness and tolerance manages to appease Paez and to avoid rupture and perhaps civil war. There begins the final stage of his life, the most of tragic and ungrateful, in which will be inexorably move the destruction of the great purpose that he/she had moved and which will have to deal with men who invoked the same principles that had fought all his life against him. Before the clamor for reform of the Constitution, it convenes a Convention at Ocaña in 1828. Far from achieving a reconciliation between the factions, is openly a violent antibolivariana grouping which does not hesitate to call it a tyrant and obstacle to the happiness of the people. Dissolved the Convention and faced open and overlapping with the followers of Santander, Bolívar returned to Bogota to take on the dictatorship. Then decreed a statute with the purpose of defending the political structure, so it is accused of reactionary. September 25, 1828 they are about to kill him; Bolivar appears dejected and defeated. The fatigue of the long years of fighting and neglected old illnesses show footprints. There is a rebellion in the Peru, Bolivia is invaded, and José de La Mar causes a separatist uprising in Guayaquil. In Pasto, José María Obando and José Hilario López rise up against the Government. Bolivar has to get back to the head of the troops and head toward Guayaquil. Before his arrival the mariscal Sucre, who had renounced the Bolivian Presidency inflicts in Tarqui, on February 27, 1829, a comprehensive defeat to the Peruvian invasion. Meanwhile circulated from the Board of Directors of Bogota news of negotiations for the establishment of a monarchy in Colombia as a solution to the insoluble problems of stability. Bolivar, who has repeatedly expressed the wish to separate from all authority does not sponsor the idea, but the ill-intentioned rumour takes advantage of the situation to attributed the intention of Crown. The panorama of decomposition seems complete without hint of any output. For 1830 has been called a Constituent Congress in Bogota who decide the future of the Republic. Bolivar appears determined not to continue in power and not intervene in the decisions of the Assembly. Finally, resignation to Congress and withdraws to Cartagena. The Congress meeting in Venezuela, under the tutelage of Paez, proclaims the final separation. Although the Liberator plan to go to Europe to take care of his ailing health, you will not achieve it. December 1 is in Santa Marta, where he/she died on December 17, 1830 in the quinta de San Pedro Alejandrino.